You're all probably wondering who I am and where Joe is. I'm one of the developers on the Developer Affinity & Growth team with him, and I'm excited to tell you about a prototype that we'd love your feedback on. 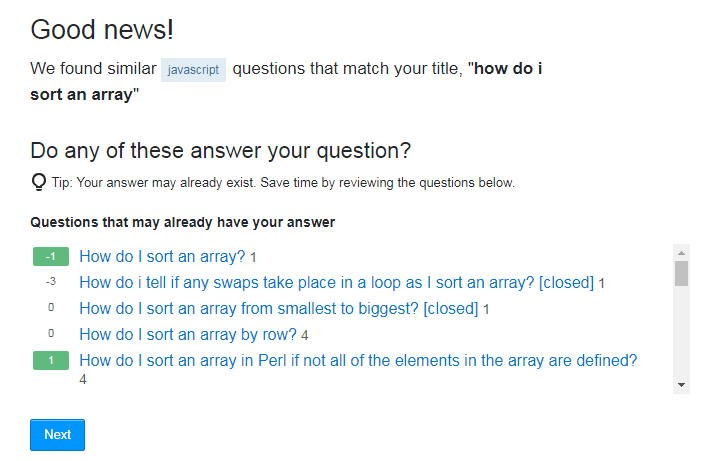 Questions and answers are what Stack Overflow is all about. The starting point for a great Q&A site are good questions. We all know that asking a good question is an art, and humans - particularly those in a hurry - aren't naturally good at it all the time. 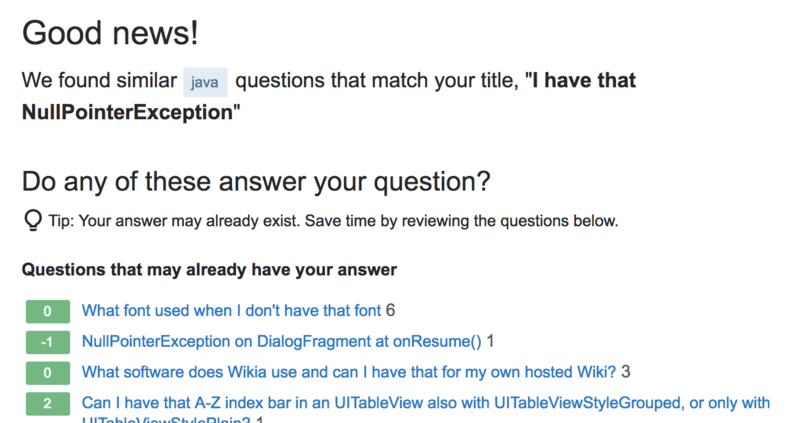 We've also known for a long time that Stack Overflow needs to provide a better "ask a question" experience, especially for people new to the community. We think we can make the experience less intimidating, help people avoid common mistakes when asking, and improve the quality of questions with a bit more guidance baked into the process. Last year we gathered a lot of ideas from the community on what kind of improvements we could invest in. 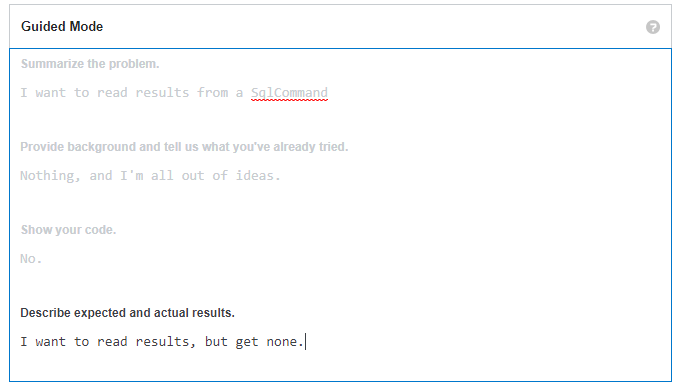 Our next step is to run an experiment on a prototype "ask a question" wizard. Before we do, we'd love for you all to kick the tires on it and give us feedback. Our goal is to get this experiment up and running in July. The experiment will be focused on newer question askers, so experienced community members won't see it, except during this comment period. Feel free to add answers below to suggest improvements to copy, the flow or any part of the experience. We'll review the suggestions to find targeted improvements before running the experiment. And, of course, once we have some data on how things went we'll report back here. I am not a UX designer, but in the "What's your title?" page of the wizard, I feel like the examples should be grouped by example, not by good or bad. See below for visual. which would result in something looking like this. It makes more sense to have this grouping to me, but I could just be crazy. You can't go back in the wizard. If you hit your mouse or browser's Back button, you start the wizard all over again - and the title, had you already entered it, is lost when you do so. I really like the setup for this. Asking them to put the tags in up front yields a massive advantage in presenting the user with targeted existing material. One major thing is missing though, in the similar questions page. Did it really though? No. It didn't take the tag into question when examining similar posts and it gave back, pardon my French, a bunch of ... well, nothing useful. Note the post with a 1764 score, 869,153 views, and a canonical duplicate target for 251 posts. That is just the first result. 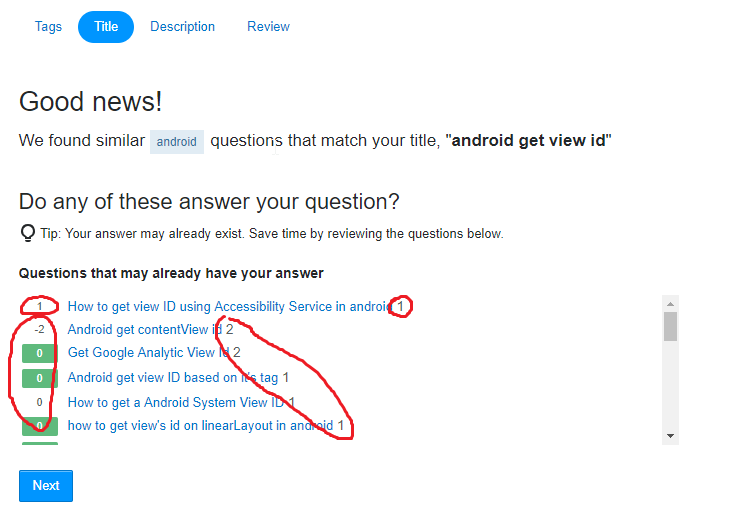 Can we please consider the tags that users enter in the similar questions search? And that doesn't really make for a readable question. Perhaps prepend some headers, like What I've tried: before those sections. Treat "Show your code" area as code, indent it for the user. At least prompt if it's not indented. Warn the OP to NOT post images when describing desired results and observed output, unless the image (and not text of any kind) is indeed the output. More notes. This time I put in "java" for a tag and "Why do I get this warning?" question title. The list of the possible matches contains a question with score -4 asked on c99. Some better filtering/matching is needed. If we already have a -4 question with exactly this title, let's tell the user to change the title (Finally! Some use for bad questions!). You ask me "Do any of these answer your question? ", but the button text says Next. Perhaps it could read something like "No, I still want to ask a new question"? That way users understand exactly what the button is doing and there's some discouragement to blindly ask anyway. When recommending other sites, the positivity is overwhelming. Their question might be acceptable there, but it has a very real chance of not being acceptable. How about this copy instead? This also colors the border of the title and question textbox/area red on the next screens. Also, the Title screen doesn't support Enter, nothing happens. The title screen also doesn't display any errors, for example for a title < 15 characters. You have optimized for debugging questions first. I get that a lot of questions from new users are useless debugging questions, so I'm okay with that being at the top of the list. Next we have two off-topic honeypots, which is OK, I guess. Next we have an option for homework questions. Homework questions aren't a "type" of question. 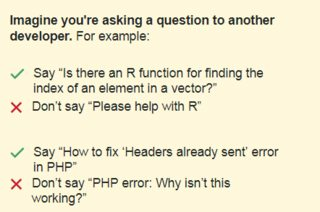 A homework question could be a debugging question, or a how-to question, or a why question, etc... The only thing that makes a homework question a homework question is that the asker was given the question for homework. This distinction is irrelevant. Only debugging questions require code. How-to questions do not require code. How-to questions that include code are actually debugging questions (if the OP includes some code that doesn't achieve the desired result, the objective for answerers is to fix the code, i.e. debugging question). 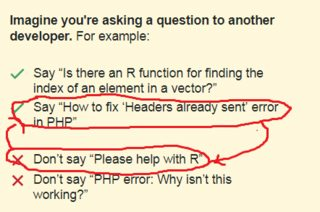 But notice how the help center article says "We feel the best Stack Overflow questions have a bit of source code in them"
This in no way means that questions without code are off-topic. 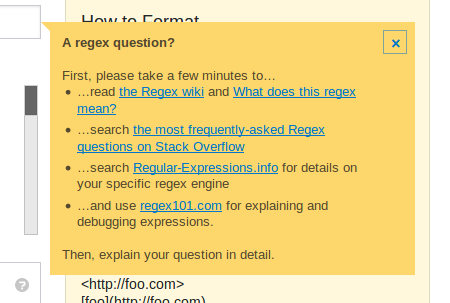 It means that some people who call themselves "we" like questions with code in them some unknown amount more than questions without code; but—just as I personally feel the best Stack Overflow questions are the timeless how-to questions whose answers have helped countless users despite having included no code in the question at all—that is neither here nor there. What can a new user gather from this wizard? Only useless debugging questions are on-topic. All other questions are off-topic... unless you were assigned the question for homework. While I agree with this in general, there are cases where it is better to include a version number. For example in the case of problems that only occeur in a specific version. 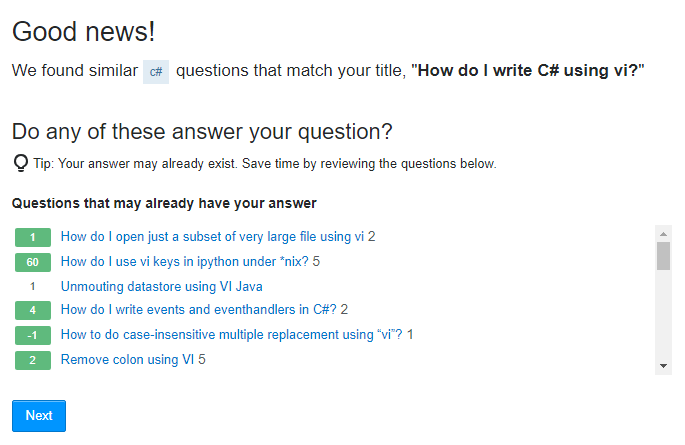 Use the python tag for all Python related questions. If you believe your question includes issues specific to the incompatible Python 2.x or Python 3.x, in addition to the main python tag, use python-2.x or python-3.x. If you believe your question may be even more specific, you may include a version specific tag, such as python-3.5. Should the asking wizard be altered to omit this? Do we really need to explicitly call out homework problems? If the policy on homework problems is truly universal, then declaring it as a homework problem is a useless moniker which would only serve to fuel the negative stigma that homework questions here already have. The code of someone trying to solve a homework problem is still "their code", so I feel like the first radio satisfies this need. I could be proven wrong, but I'm not sure this is necessary. Somewhere you need to explicitly prompt them for any Exceptions or Error messages. Possibly in the Guided Mode page? I see a LOT of questions posted where the OP mentions an exception but does not include the actual detail, which results in a lot of back-and-forth in the comments encouraging them to post it. Encouraging them to include this in the first place would eliminate that noise and frustration. This statement is true, to some extent. However, if anything really important is left out, or if the post is just a rough draft, it is just as likely the question will get closed before it gets edited by the OP. It may be best to inform them that posting the question will yield immediate results and scrutiny. They will be expected to respond to any clarifications immediately. NOW NOW NOW. Something that really hammers in the point that this question is about to be seen by a lot of real people at once the split second it is actually posted. Many new users are not aware of how instantaneous the response is here. As a result, there is a severe lack of attentiveness. I think there is an opportunity with this message at this point to at least give them some sort of warning about what is to come once the question is actually submitted. Why am I getting the wrong output? 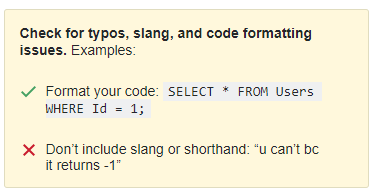 Tip: Tell us which specific part of the code you don't understand. Tip: See if you can find documentation about the part you don't understand first, and whether that answers your question. Can you write code for me? With the exception of the last point, all the others should probably also have a tip about debugging. Putting myself in the shoes of a new user, I'm not sure what these numbers are supposed to mean. Maybe we need to put a legend, or make this tabular? Might just be a minor nitpick though. First, it looks really nice, and looks like it has potential of reducing duplicated, and maybe even helping people find answers to their questions. One thing I noticed is that many validations we have today are not displayed while filling the title, but are displayed only in the "Review" step - they would look much better at the appropriate step, after filling the title. We may want to re-think how they fit in and whether they are still needed. What languages, technologies, and/or frameworks is your question about? A tag is a word or phrase that describes the topic of the question. 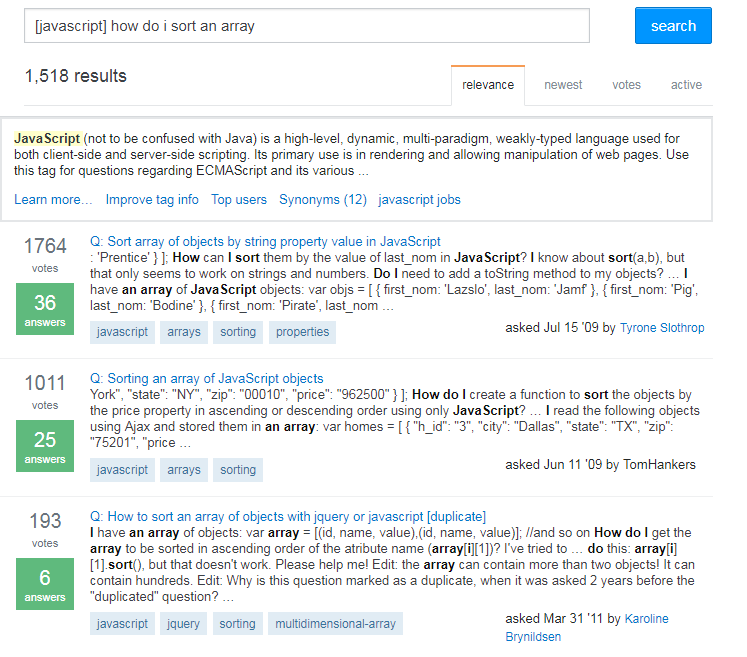 Tags are a means of connecting experts with questions they will be able to answer by sorting questions into specific, well-defined categories. See here for more information. 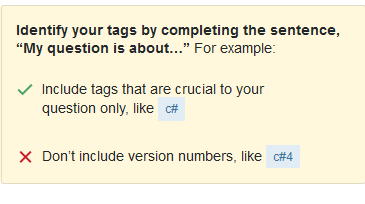 Each question may only contain 5 tags at a maximum, so choose the ones that best describe your question. To add a tag start typing into the box below. Select the relevant tags from the list that appears underneath. This might seem obvious to us but it may not be to someone new to the site. Tags are an abstract concept that often new people get wrong, misunderstand, etc. The point of a wizard is to guide people through this minefield. This currently isn't really adding anything useful in this aspect. It's just showing the same information in a slightly different ordering. TLDR: Consider not showing the question editor in the review step. The last step, "Review" has a format similar to the normal "Ask a Question" page. This may have been intentional, to get new users used to what that would look like, but I had hoped that the ask wizard would address a problem that I have suspected some new users run into. I've seen a lot of questions where I thought, "surely this person overlooked the question preview. If they knew their question was going to be posted looking like that, they would've tried to do something about it." I guess for some of them, that was probably wishful thinking, but hopefully not all. I think having the editor available in the review stage draws attention away from the question preview. 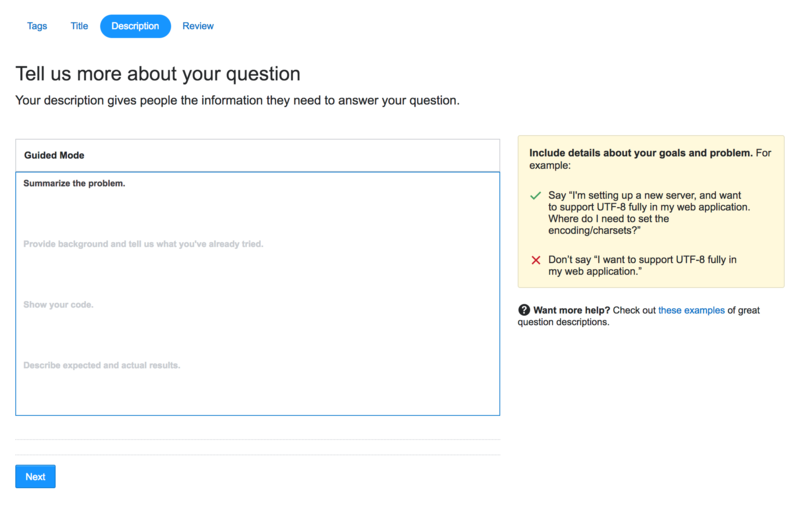 I think new users might benefit more from a confirmation step with just the preview, where the editor isn't shown and they get a prompt like "Your question will look exactly like this, and lots of people will start looking at it immediately. Are you sure you want to post it?" There's a similar feature request for the main ask page, and in some of the discussion there I see some points against it in that context, but maybe in the wizard it would be more fitting, since it's already a multi-step process, and you've made it simple to go back to previous steps to make changes. 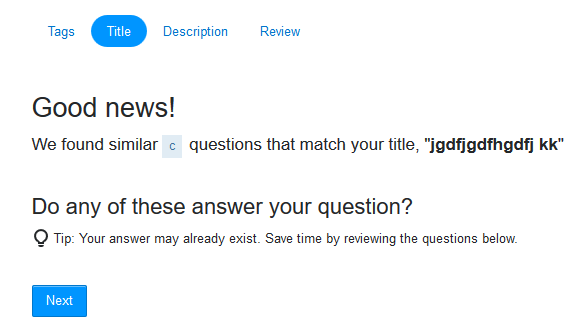 Maybe it would also be helpful to mention in the text under "Review your question" that markdown editing help is available in the editor. "If you're having trouble formatting your question, click the question mark in the editor toolbar for help." I've seen many new users who didn't notice that was there until someone pointed it out to them. No matter what, that list should start with this guy. It should also allow sorting using different criteria, such as upvote count or created/last modified dates. Honestly: if you do not fix the really bad internal search for duplicated questions, then you can as well drop this part of the wizard. I have closed zillions of Java questions, and I almost never use the internal search. Because it is of no value to me, an experienced member of the community. Not a newbie making his very first steps here. And remember, this is really not a new complaint. And to be really clear: this answer is not a "duplicate" of Callums. He complains about links giving the wrong impression. I am complaining about the wrong links being shown. Finally: having the wizard is a great idea, and I hope it works out. It is just that "finding duplicates" is such an annoying undertaking using the built-in search (and UI capabilities). The wizard strikes me as a little backwards: Current progression is tags -> title -> body. When I write a question, I always write the body first, then the title, then take some of the suggested tags. Why not move tags to after the body, in order to take advantage of the tag suggester? The title I can understand, since it uses the fancy possible-duplicate-suggester it could save time (and result in fewer duplicates) to write the title first. 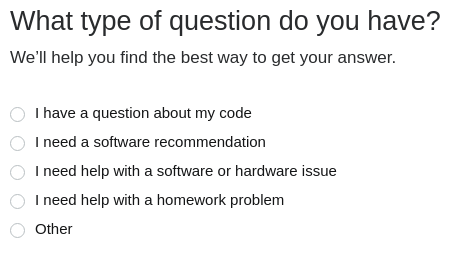 This looks great for about half the potentially-good questions on SO—questions about debugging some attempted code, and about getting unstuck on a homework or non-homework coding problem. And it looks great for dissuading two major categories of off-topic questions, those that belong on softwarerecs and superuser. click "other" and then include a bunch of irrelevant source code to my question, possibly instead of the information about, e.g., how I installed Python 3.5 and 3.6 and virtualenv and what platform I'm on—which would have been obviously useful if the wizard hadn't confused me. So, I think the wizard needs to be broader, to cover other kinds of questions that can be potentially just as good as debugging and stuck-coding problems. Maybe a more general issue, but why is there no character limit to the tag box? You can overload it and cause text run off for days! The help box on the right side is a little... jumpy! The "next" button dead-ends1 me one a page which says. "The Super User community is here to help you with a software or hardware issue." 1No, there is no way to go BACK the BACK button on my browser is disabled. That is not only annoying, to me it is rude! "We know what is best for you, do what we say!!! But that issue has already been addressed in other answers"
Indiscriminately pushing users to other sites carries a risk of eventually breaking proposed design. Something like that already happened in the past when some site communities forced Stack Overflow to remove them from migration targets (1, 2). If other sites get flooded by inappropriate questions from users misled by wizard, they can demand removing "quasi migration" references. Since the wizard already prepared a user that they will have to go some extra steps prior to posting, it would be only natural if they pass one extra step of going through other site help center page prior to posting over there, wouldn't it. ...and actions allowing to pick whether to proceed to that site or go back to the prior wizard page. It's worth noting that referring users to the Help Center pages instead of the sites' main pages addresses (at least partially) concerns raised in Ways to give users some specific education about question quality and topicality and multiple discussions linked to it. This is a more specific version of this answer. If the user mentions "error" or "exception", suggest that they copy and paste the compiler error, exception traceback, etc. into their question (and format it appropriately). If the user mentions a popular tag but didn't include that tag in their question, ask whether they're sure they didn't want to add the protocol-buffers tag. The very first step, "What type of question do you have? ", doesn't help filter out requests for code review. 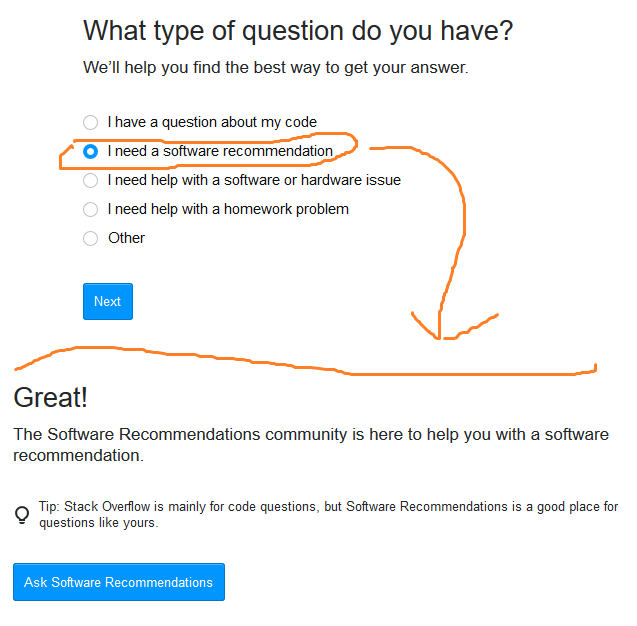 "I have a question about my code" is exactly what someone looking for CR would pick, and their choice is immediately validated by a large, friendly "Great!". Having their questions closed as off-topic after this would probably come as kind of a slap in the face. I have a problem with my code. I would like some feedback on my working code. Not the answer you're looking for? Browse other questions tagged discussion questions ask-question-wizard .